We challenge you to solve a scientific game inspired by the series Friends and probabilistic theory. Between 1994 and 2004, Friends marked an epoch and a generation with its superb and hilarious reflections on the always difficult and conflictive journey from youth to adulthood, through the adventures of six unforgettable friends. Even though this was only a fictional game, the origin of the theory of probability is found in an absolutely real game, with dice, money and a subsequent exchange of letters between two of the most important mathematicians of the time. It all began in Patis when the professional gambler Antoine Gombaud, Chevalier de Méré, turned to Blaise Pascal for help in solving the outcome of an interrupted game of chance known as “The Points”. The game consists of adding up points by throwing a dice, with the winner being the player who first reaches a specific total. It seems that Gombaud and another knight were obliged to interrupt a game with a considerable sum of money at stake. When deciding what to do with the bet, Gombaud asked Pascal if there was any fair way of splitting the sum based on the scores that both players had at the time of the break. That meant calculating the chances of victory of each participant if they had continued throwing, so that the money could be distributed according to this calculation. To solve the problem, Pascal wrote to his colleague Pierre de Fermat, starting an exchange of letters that led them to open a new field of study in mathematics: probability. They also discovered the fundamental principles that govern all games of chance and that allow players to design game strategies and place their bets, principles that are also applied by those who speculate in the stock market. 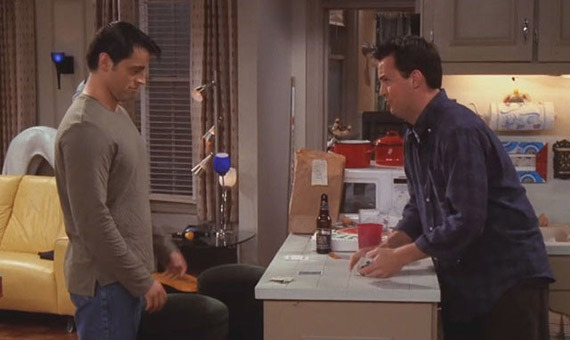 Back to Friends and “Cups”, the peculiarity of the game devised by Chandler is that he improvises the rules on the fly so that his friend Joey always wins, regardless of the pair of cards he takes from the deck in each hand. Unlike “Cups”, the game that we propose below does have some established rules. But in the same way, the key again is that Joey always wins. 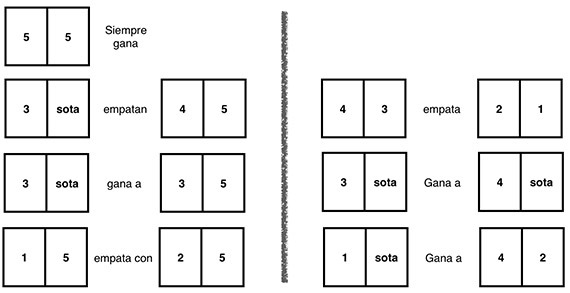 It is played with the first five cards of each suit (from ace or 1 to 5) and the jack, which in this case is equal to 0. Each player picks the first two cards from the deck in each hand and shows them. The player who comes closest to or equals JOEY wins. As “logic” stands, JOEY is written with the English alphabet, which has 26 letters (Y is number 25). Once the logic is understood, guess which hand triumphs in each one of these four mystery hands. Knowing that JOEY is written with the English alphabet, each letter is given the corresponding numeric value: J =10; O = 15; E = 5; Y = 25. Then, JOEY = 10 + 15 + 5 + 25 = 55. And in the same way: JOE = 30; JOY = 50; JEY = 40; OEY = 45; JO = 25; JE = 15; OE = 20; JY = 35; OY = 40; EY = 30; J =10; O = 15; E = 5; Y = 25. So, each hand is won by the couple of numbers (cards) that exactly equals the greater number of different letters (repetitions are not allowed) from JOEY. Of course, JOEY always wins.